Looking through my web stats the other day, I noticed that some of the common searches bringing readers to my site relate to smoking and health insurance. Cigar smokers in particular seem to be interested in this. And for good reason: The Affordable Care Act generally requires health insurers to treat applicants equally, but it makes an exception for smokers. Premiums for smokers are allowed to rise up to 50% higher than for comparable non-smokers. At Wednesday’s TriMet board meeting, Cascade Policy Institute President John A. Charles, Jr. presented a detailed critique of TriMet’s proposed tax increase, and urged the Board to cancel public hearings on the tax proposal set for August and September. Over the past several months, TriMet has been quietly meeting with business associations and large employers in efforts to gain political support to raise the rate of the regional payroll tax it imposes on most employers within the transit district. The current rate is 0.7237 percent. The proposal is to raise it by 1/10th of a percent, phased in over a ten-year period. Minimum Wage efforts argue: $13.50 or $15.00? The Raise the Wage Coalition has held a rally and started a campaign to raise the minimum wage to $13.50. This comes at the same time a different organization, 15 Now, is pushing for a $15 minimum wage. See video below. – MTV never featured music videos. – The Simpsons has always been on TV. – Microbreweries have always been ubiquitous. – There has always been an airline going into, or coming out of, bankruptcy. – Stadiums, sporting events, and music tours have always been sponsored. – Global warming has always been a crisis. – 9/11 is a meme (“jet fuel can’t melt steel beams”), rather than a national tragedy. – The Soviet Union never existed and there has only been one Germany. – Google has always been a verb, and Milli Vanilli has always had no meaning. – They have never used a floppy disk and they don’t know why CC stands for carbon copy. While an at-will employee may generally be discharged for any reason, a discharge may be deemed wrongful — and will form the basis of a common law wrongful discharge claim — if it occurred because the employee fulfilled some important public duty. Last month the Oregon Court of Appeals expanded the important-public-duty exception, holding that a domestic employee who is fired for reporting that the employer had committed a crime involving child abuse has a wrongful discharge claim. What Did the 2015 Oregon Legislature Accomplish? Health Care and Medicaid Funding: With very little drama, the Legislature passed a four year extension of the hospital tax. This extension keeps a key piece of the state’s Medicaid funding package intact, which means low income residents will have continued access to the Oregon Health Plan and other health care subsidies. This edition of the Graph of the Week highlights the relationship between home prices and new home construction across the 50 largest metros in the country. (Original graph idea from Jed Kolko, formerly of Trulia.) It comes out of some work Tim Duy and I did recently in a different venue but is important to highlight. 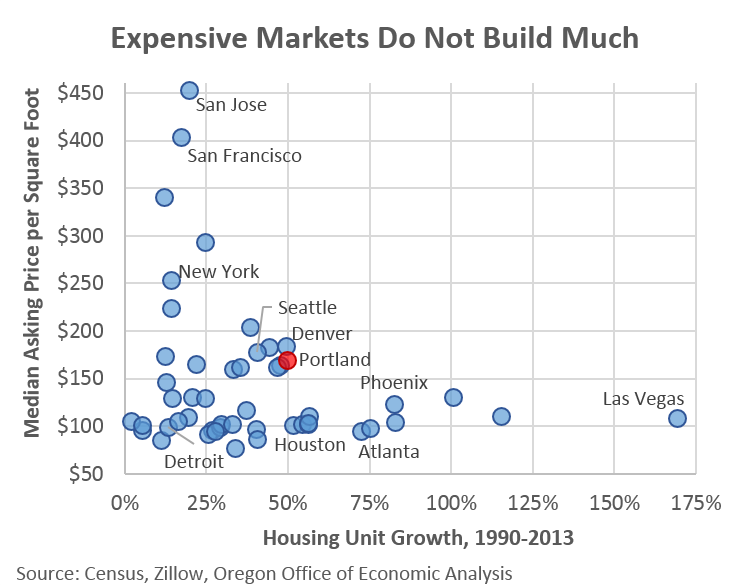 In essence, expensive housing markets do not build much new construction. Portland, along with other popular cities like Denver and Seattle, are right on the middle of the curve, essentially indicating that we’re adding just enough housing to keep affordability at a somewhat manageable level. These regions are keeping their heads above water, but just barely. Find an interactive version of the graph here. A group of eight United States senators sent a letter to the U.S. Department of Health and Human Services (HHS), the Office of National Drug Control Policy (ONDCP), and the Drug Enforcement Administration (DEA) requesting information about the agencies’ efforts to facilitate and coordinate scientific research on medical marijuana. The letter was signed by Senators Elizabeth Warren (D-Mass. ), Barbara Mikulski (D-Md. 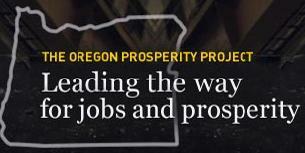 ), Barbara Boxer (D-Calif.), Ron Wyden (D-Ore.), Jeff Merkley (D-Ore.), Kirsten Gillibrand (D-N.Y.), Edward J. Markey (D-Mass. ), and Cory Booker (D-N.J.). The senators explained that while twenty-three states and the District of Columbia have now passed laws allowing for medical marijuana use, and an additional fifteen states allow access to cannabadiol (CBD), there are still barriers to research on the potential health benefits of marijuana. The letter highlights the unique opportunity and important role federal agencies have to collaborate with states to conduct population-based, clinical, and other basic research on marijuana. Our 13 year-old daughter just returned home from a two-week exchange program in France. She had the time of her life. But the surprising difficulty we had with money and banks got me thinking, once again, about the huge potential of crypto-currencies. Several months ago, our daughter told us she would need a bank-issued debit card for her trip. Other friends, however, said a pre-paid Visa or MasterCard, purchased at CVS or Walgreen’s, would work just as well. I made some jokes about traveler’s checks — so old-school — and assumed our friends were correct. So a couple days before her trip I loaded pre-paid Visa and American Express cards with several hundred dollars. But when I got home, I realized that despite my attempt to read the fine print at the store, the cards might not work internationally. Portland rated as over-priced city. Portland placed #12 on Forbes’ list of America’s Most Overpriced Cities. Los Angeles was #1, followed by Chicago, Miami, and New York. To come up with the list, Forbes compared the housing prices, living expenses, unemployment rates, and average salaries for workers with a bachelor’s degree or higher in the country’s 50 largest metropolitan areas. Out of the 50 areas studied, with #1 being the most expensive, the Portland-Vancouver-Beaverton area ranked #19 for cost of living; #39 for housing opportunity; #28 for unemployment rate; and #30 for average salary.